How can I improve the layout of the blog? Is it okay to have the designer listings on the front page or should I create specific buttons for each one and move them to separate pages? Information about me is low on the page, because this blog isn’t about me, rather about blog designers and what they offer. But, do you think I should move “me” up the page? I was occasionally doing designer showcases where I focused on a specific designer, but have lately just been high-lighting current giveaways, new free templates by designers and other blogging aids. Should I restart the showcases or just stick to giveaways and new free templates? I don’t think I’ll ever have a huge following, because once a blogger gets what they need (a free, premade or custom design of their choice) they don’t really need my blog anymore. However, I would like to generate some traffic before they go. Would it be rude or forward to ask them to post about my blog when they do get a free template or custom design (if they found their design/designer through me)? My blog is pretty “sticky,” with visitors staying an average of 7 minutes. However, I would like to increase the traffic. 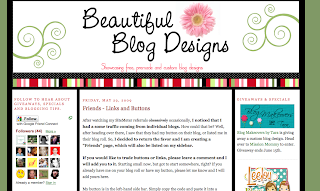 How can I better spread the word about Beautiful Blog Designs and what it offers? Are there other things I should add or take away from the blog to help it be more user friendly? BlogCoach readers, what advice can you offer Amanda?